A gift card makes shopping convenient for you, and fun for your loved ones! Gift cards are conveniently emailed directly to the recipient upon completion of your order. Gift cards are available in $10, $25, $50, $75, and $100 values. 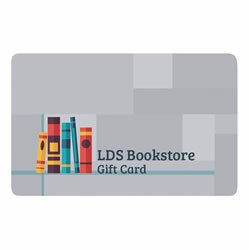 At LDS Bookstore, we are pleased to offer a wide selection of gift cards, available in values of $10, $25, $50, $75, and $100. Immediately e-mailed to the recipient upon the completion of your order, gift cards can be used on all of our products and are a great way to make shopping at our stores convient and fun. Our gift cards are perfect to give to family, friends, co-workers, missionaries, and converts. Not an official website of the LDS Church.